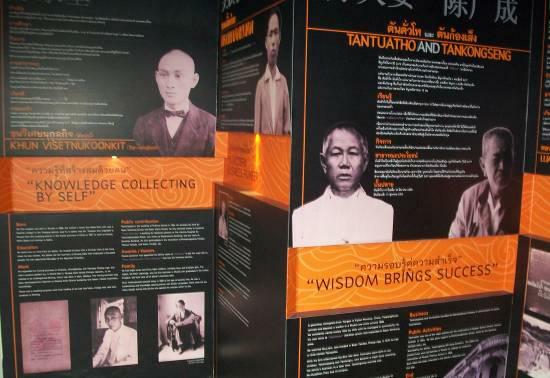 Learn About Phuket’s Chinese Heritage. 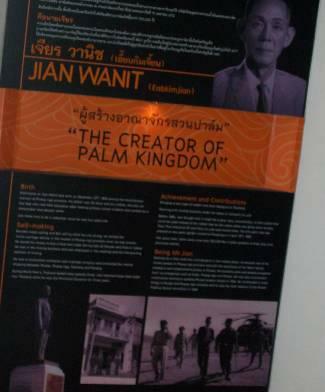 Interested in Phuket’s Chinese heritage, not sure why there seems to be such a Chinese influence in and around Phuket Town? Well here is a great way to learn more about Phuket’s history so you can impress your family, friends and expand your knowledge in general. I do remember always trying to take the kids to interesting museums when on vacation to widen their general knowledge while enjoying a fun family outing. 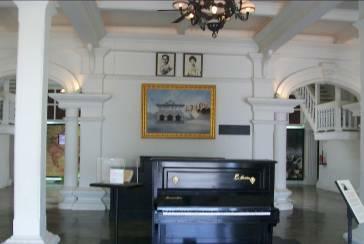 Upon entering the museum after paying the 200 baht entrance fee you are greeted by a beautiful room with multiple piano’s that have played roles in Phukets history. While enjoying the ambiance of this room, take a few minutes to look through the pamphlet given to you as you paid. This will give you an understanding of the museum, its purpose and history. Briefly, the build was established as a Chinese language learning center, the oldest in Phuket. The school was originally established in 1934 and was only recently converted in 2010 to a museum to showcase the Chinese-Phuket people’s way of life from their early arrival to work in the tin mines to a position of prominence and patronage in Phuket. In the thirteen exhibit rooms the various aspects of this progression are displayed as to how these immigrant people became the model of success. The first set of rooms you mainland China to Phuket, where did they come from and why did they come. Which parts of Phuket did that choose to settle and why. The migration is broken in multiple periods, starting as early as 1,000 years ago lasting through the Ayudha era (about 300 years ago) and the Rattanakosin era (about 200 years ago) until now. The second and third rooms contain displays outlining the various alliance’s and close relationships existing between China and the Chinese residence of Phuket. 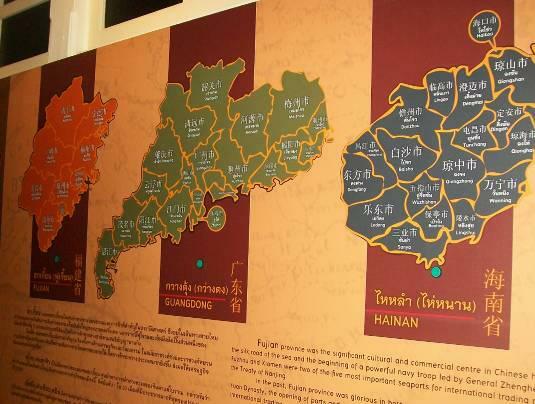 These rooms contain displays showing the supporting associations of the overseas Chinese with organizations here in Phuket and demonstrate the good relationships that existed and still exist between Phuket and mainland China. The fourth room follows this same theme, in the specific role that patrons played in establishing the Thaihua School. The fifth room displays continue the focus on building the history of the school, presenting the principle of Chinese housing construction, and architectural identity. 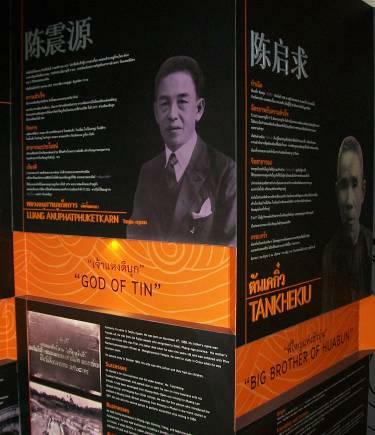 The sixth room concentrates on displaying the various ways the Chinese influenced the Phuket way of life, including the occupation and livelihoods; literature and intellect. 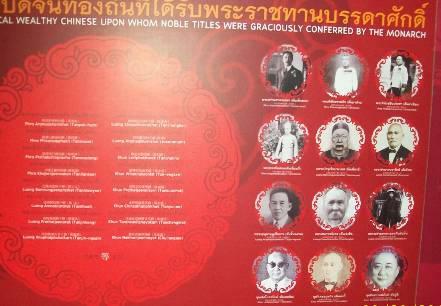 There are histories of common Chinese people from the past 100 years that made Phuket their home. 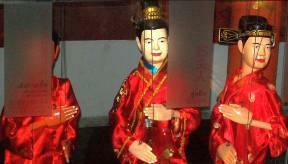 A prominent point is the display of the 3 Phuket-Chinese intellects in puppet (Kateh) form. 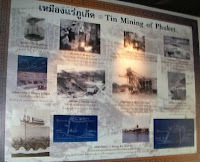 The seventh room displays the importance of tin mining to the migration of the Chinese to Phuket. 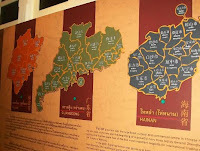 In here are exhibits of mine construction and what role these mining operations played in the development of Phuket city, chronicled are the various periods in the development and decline of tin mining in Phuket. In the eighth room displays of the attire worn by the Chinese people from over the centuries are presented. Display on one wall is a mural of a Chinese wedding and many pictures of various manner of dress. The ninth and tenth rooms again focus on portions of the history of the Thaihua School, the ninth concentrating on the biography of the first headmaster, Master Surpin. How he helped navigate the school through troubles and problems related to foreign country policies of the western superpowers of that time with sacrificing the integrity of the teachers. The tenth focusing on the feeling of the actual classrooms from the school, including the desks and chairs from the classroom, with pictures of students prominently displayed. The eleventh room focus’s on the influence the Chinese people and their knowledge had on the buildings in Phuket city, with many pictures of the various homes and buildings highlighted on a map of the old town area. The twelfth room refocus’s on the valued heritage the Chinese people brought with them in their traditions and ceremonies. The displays chronicle many such ceremonies, from birth to the death; with a set of photos of the annual Phuket Vegetarian festival help in Phuket Town. Finally the thirteenth room shows the various influences that the Chinese had on the local cuisine, both ingredients and cooking methods. 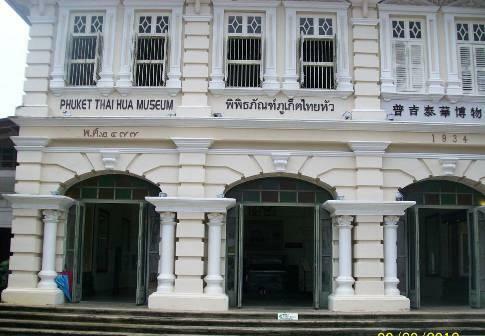 The Thaihua Museum runs under the management of Kusonsongkhroh Foundation (aka Lok Xian Kok), a charitable organization with a long history dating back to the mining era in Phuket. It was set up by a group of the local well-to-do immigrant Chinese businessmen. Their original plan was to help their unfortunate fellow immigrants and to help improve living conditions for the islanders by building hospitals and schools. They still carry on the same mission today. OK, now we know what is in the museum’s thirteen separate exhibit rooms, the question looms, do you have to start in room one and go consecutively through the various displays. No, actually the museum is not laid out in a manner conducive to ding this; rooms 1 thru 7 are located on the second floor along with the library and the stairs to the second floor are on either side of the entry lobby. I actually started my tour in room 10 while trying to find the stairs and then wondered around the first floor until heading upstairs. 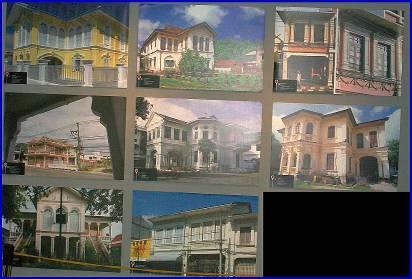 The museum is not very large, but the exhibits are very nice and informative. 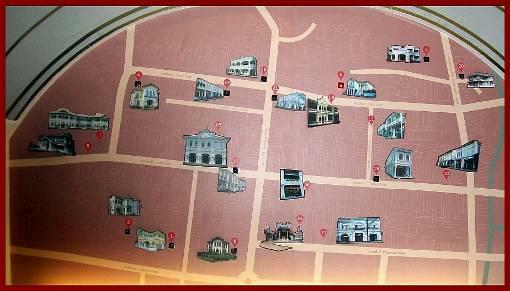 The building itself is located on Krabi Road and was not difficult to find and I often get lost in Phuket town so it must have been simple. It is not far, within walking distance ( keeping in mind that I don’t like walking) of the last stop of the Patong-Phuket Town bus, just ask when you get off the bus.